ESP LTD F series bass case boasts a multi-ply wood shell with heavy-duty black Tolex covering, heavy-duty hardware, easy-grip molded handle, soft padded interior, accessory compartment, and neck support. Logo on lid. 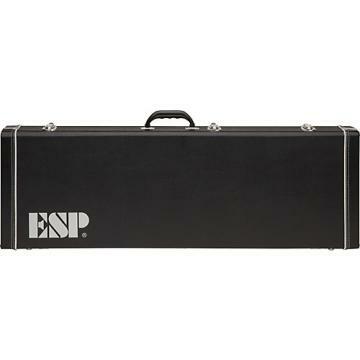 An ESP-approved hardshell bass case for your ESP axe. Order today. This is a good case. I have one, and it is durable. The tolex stuff will get ripped a little on the corners, but the point is to baby your bass, not your case. It is heavy, but usually you don't carry these too far. I play a fare number of shows, and it has been good. The storage compartment holds lots of stuff. There isn't a lock, but you can put a padlock on the middle latch is you so choose. .Excellent case made by TKL for ESP. All latches line up nicely, the hinges are straight, and the interior is very plush. Well worth the investment to protect my DF-404. Other than the strong glue smell, that went away after a few weeks (which my Spector case has too, also made by TKL), I have no complaints. There was one tiny spot where the stitching on the binding wasn't completely dyed, but a small touch up with a black sharpie covered it perfectly. Overall GREAT case. .The case is great overall. I've had this case for about a year now and while touring has paid a toll on the outside, it's still in great shape overall. It is a slightly heavy with my bass in it though, but not so heavy that you couldn't carry it for some distance. The interior is very nice too, and the compartment fits your straps and a tuner and other small stuff.
. This was an ESP Universal case but wouldn't fit their ESP 6 String bass - I had to pay $49.00 to ship it back and order a custom case. I feel ripped off big time !!! .This is a perfect fit for my SCT-607B 7 string Baritone Telecaster. It's a smidge too long for a normal Fender type case.